Academic Career: CGS 1897 -1905. Other: Land agent. P.A.S.I. County Agent, North Riding of Yorkshire County Council. Harry was the eldest son of Henry Higginson, an architect born in Preston, and Wilhelmina (née Scott) from Dumfries, the daughter of a bookseller. There were three more boys, Arthur, Frank and Norman, and a daughter, Dorothy. In the 1891 Census the family was living at 28 Petteril Street, but in 1911 the family was living at Howard Place. Wilhelmina had died in 1908 however and by 1911 Harry was living as a Boarder in North Yorkshire as Land Agents Clerk. According to the Cumberland News Harry had been a good all-round sportsman at school and was an especially good golfer. Harry fought with the Canadian Overseas Expeditionary Force. The Canadian attestation paper reveals Harry was 5’8” with fair hair and grey eyes. The Medical examination was dated 8 August 1914 (literally days after war was declared in Europe) and the attestation papers were dated 2 September 1914.Harry gives his profession as a surveyor. Harry’s brother Frank also joined up in Canada as soon as war was declared. He travelled to Salisbury Plain for training and sailed for France in February 1915. In July he was wounded in action by a bullet in the groin. After transferring to hospital, he displayed no serious symptoms for a week, but then septic poisoning set in and his condition became critical. Harry’s father, having received a telegram appraising him of his son’s condition, decided to go to Havre to see him. 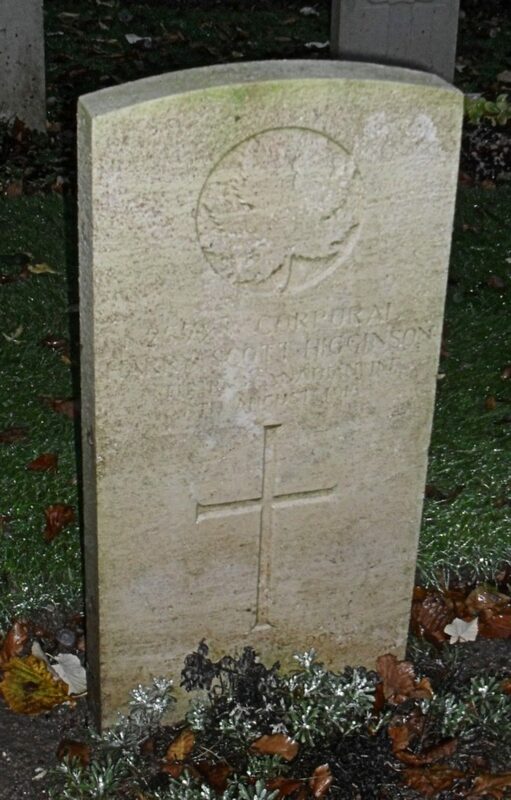 The Cumberland News of 14 August 1915 continued by saying: “The permit to cross the Channel however, was issued too late, and Mr Higginson only reached the hospital at nine o’ clock last Sunday night to find that his son had died that same morning at two o’clock. His son Frank had received a permit to leave the firing line in order to see his brother, but he also reached Havre too late, the train in which he travelled being held up 24 hours on the way through an accident to another train. The funeral took place at Havre and was attended by both the father and brother of the deceased.” reported Harry’s death saying he had: “reported wounded in Flanders a few weeks ago, has succumbed to his injuries in one of the Base Hospitals in Havre.” He died of wounds to the groin and buttock according to the death report. Harry’s funeral took place at Le Havre and was attended by his father and brother. After leaving school, Harry had trained as a land agent in the estate office of Lord Downs at Wickham near Scarborough. Later he spent 18 months near Hexham before moving to Jervaulx, Yorkshire, and then to Nothallerton. He spent four years in the County Buildings offices in Northallerton before leaving for Canada to join his brother Frank who held an important position with an architect’s firm in Montreal. Harry travelled to Halifax, Nova Scotia on 17 April 1914.